Santorini Island consists of semicircular archipelago of volcanic islands located on the southern Aegean Sea, between the islands of Ios and Anafi. In Greek, Santorini is also known as Thira or Thera. 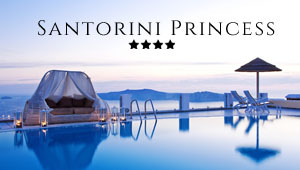 Santorini is a part of the Cycladic group of islands. The area of the island is 96 sq km whereas the coastline surrounding the island stretches for almost 69 km. The capital of Santorini is Fira and the entire population is about 13,500 people. The main port of this island is Athinios and it gets extremely busy in summer. This island had always been subjected to volcanic eruptions from the ancient times. The view of the giant Caldera and the impressive geology of Santorini island reveals the dreadful volcanic activity that had taken place in the past. The best example of Santorini geography is the famous caldera, which is strongly connected to the history of the island. Circular in shape, this caldera is entirely filled with water. In fact, it is the only sunken caldera in the world. It resembles to a lagoon as the water depth here is 400 meters. This caldera is surrounded by gigantic cliffs on top of which beautiful villages have been constructed. According to geologists, the first known eruption took place in the year 1,645 BC. This eruption was responsible for the tsunami waves that hit the northern coasts of Crete and destroyed the Minoan civilization that flourished that time. It is also speculated that the seismic activity of Santorini volcano could be an explanation for the Exodus of Moses and the Jews from Egypt. For almost 1300 years after that eruption, the volcano was completely inactive. But later on with its minor eruptions it created the islands of Palea Kameni, Mikra Kameni, Macronisi, Aspronisi and Nea Kameni. The last serious eruption happened in 1957, when the earthquake caused destroyed many houses and public buildings on the island. Since then, the volcano of Santorini had always alerted scientists and geologists with startling proofs of seismic activity down the years. This extreme volcanic activity has formed the culture and architecture of the island. The villages of Santorini are perched on the edge of the caldera and give breathtaking view to the sea. In fact, you can try some trekking from Fira to Oia and enjoy the wonderful landscape of the island. Santorini map View the map of Santorini with the main villages, beaches and sightseeing. Also, location of the port and airport.